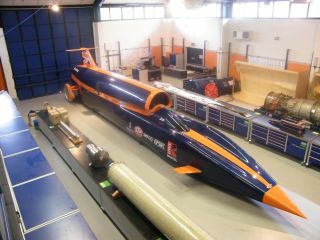 The Bloodhound project is one of the most exciting ever to hit the UK. So much that it's hard to believe that a car that can 1,000mph is being built in Bristol, but by 2013 the folks behind the Bloodhound SSC car hope to break the current land-speed record by a massive 31 per cent. Considering this is the same team that holds the current land-speed record, set by its vehicle the Thrust CC and driven by Royal Air Force Pilot Andy Green, it's a safe bet that when the Bloodhound SSC makes its speed attempt it will become a record breaker. To get an insight into what it's like to have the UK as a base for such a huge task, we spoke to James Painter, Engineering Lead – Vehicle Integration, about how they have found creating the Bloodhound SSC in Britain. TechRadar: Bloodhound is a high-profile project showcasing British engineering and design - do you feel that we have enough of these kind of projects happening in the UK? James Painter: We certainly need more showcase projects that open people's, and especially children's, eyes to what it means to be an engineer/designer/scientist. Projects with 'wow factor' that capture the imagination and inspire are in short supply. Hopefully Bloodhound can be a 'Concorde' or 'Apollo' type project and do just that. TR: A few very high profile people (like Sir James Dyson and Sir Richard Branson) have told TechRadar that we are not producing enough engineers or promoting innovation - do you think this is the case? What are the educational objectives of the Bloodhound SSC project? JP: The feedback that I hear from industry is there is a shortage of engineers and scientists across many fields, and that some companies out there are struggling to find people with the right skills set. I believe innovation and developing new technology will continue to becoming an increasingly important part of the UK's economy going forward; as a route to building new businesses, creating jobs and creating wealth. With this in mind the more we do to encourage and nurture innovation the better. The Bloodhound Project aims to inspire and encourage the next generation of engineers and scientists that among other things will hopefully help this country and the world deal with the challenges of a low carbon economy. Bloodhound is currently engaged with 4,500 Primary and Secondary schools across the UK and has fans in 207 countries worldwide. TR: Do you think that Britain has lost its touch in design and engineering, or do you think the potential is still there? JP: Britain still has a fantastic pedigree in many forms of high value added engineering, for example aerospace, motor sport and medical based engineering. However to enable us to compete with both established and emerging nations now and in the future we need to be continually pushing the scientific and technical base that exists within this country. We have a shortage of engineers and scientists now and this situation will only get worse if we don't address it.